Pool Head Farm, Kinderton Street. Home of the Moreton family and a lovely old building full to the brim with grandfather clocks and other ancient curiosities. If you want to picture exactly where this house was, stand on the front doorstep of The Boar's Head and look up the road to where the new houses have been built on the old station yard. Pool Head farmhouse was roughly in the middle of the road. The pool itself has also gone - filled in, flattened and built on. It once provided water to power the corn mill (now 'Town Bridge Motors') and was fed, via a little mill stream which also supplied water to the water tower at Middlewich Station and then ran under King Street in a culvert. The pool drained into the River Croco. Behind the tree on the left, we can just make out the rear of a large billboard, companion to the one at the foot of the railway bridge. Sherry Hill-Smith: Up the road? You mean the new houses on King Street, across from the Factory Outlet shop - or towards the Masonic Lodge, down that way? The houses across from the industrial estate where SpanSet sits? Stephen Dent: Very interesting. It's not quite in the position I thought it was. Dave Roberts: Another way of looking at it is this: At the very end of King Street is a traffic island. The farmhouse was situated round about there. Jonathan Williams: We lived in one of the houses on the same side of Kinderton Street as the Boar's Head, where the Factory Shop is. It stood right on the edge of Kinderton Street. Mum and Dad moved there when they married fifty years ago. 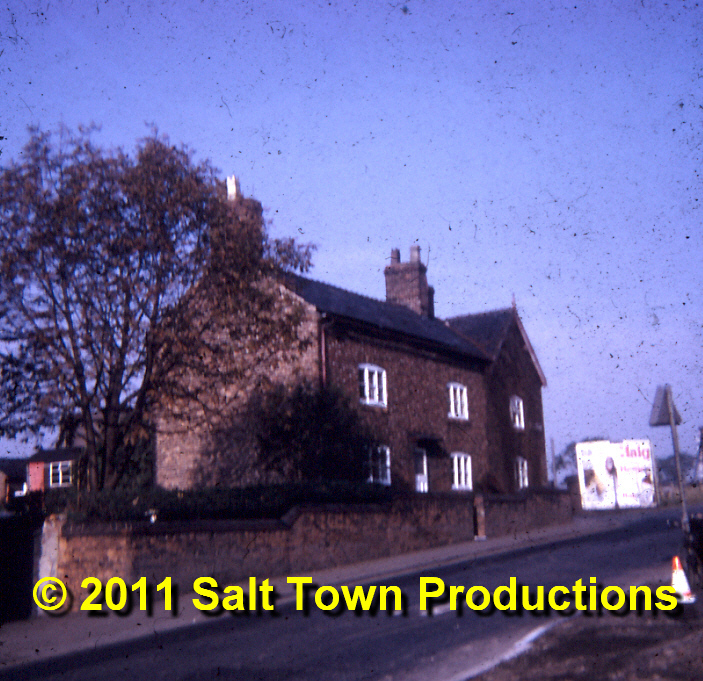 We lived there until around 1967/8 when the chimney imploded and the houses were knocked down (I think) as part of the road-widening scheme. The parking area outside the Boar's Head is the original line of Kinderton Street. Sherry Hill-Smith: Ahhh! I'm with you now! Dave Roberts: Yes, sorry Sherry, that 'in the middle of the road' bit probably misled you. Jonathan - yes, I can remember there being houses on that side of Kinderton Street, including one very tall house with a flight of steps up to the front door. Geraldine Williams: (19th April 2011) That was probably ours, Dave. Number 18 was a 3-storey building and I understand it was used as a telephone exchange at some point. It adjoined what used to be Clewes' Bakery. The Jordan family lived there before us. We were re-housed in Alexandra Road as part of the road-widening plans.